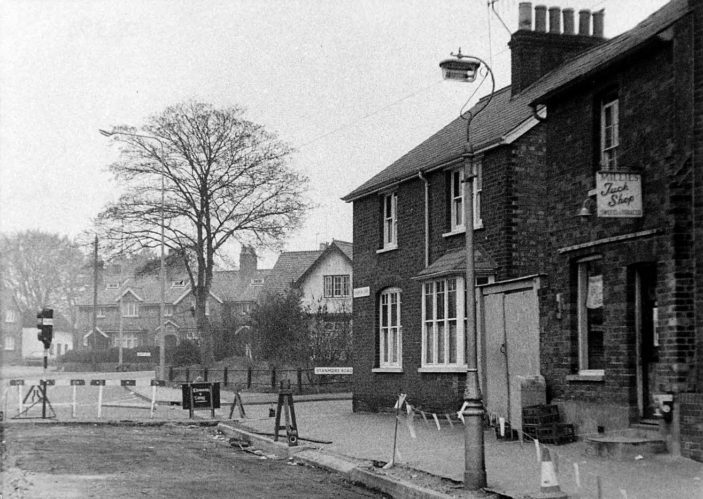 Millie’s Tuck Shop in Church Lane in 1973 at the extreme right of the picture. This may have been the confectionery shop originally run by Amelia Howard and later by Alice Kefford in the 1930s. Peter, the old Police Station was behind the house you describe, across Stanmore Road. Built in Victorian times; there’s a photo in one of my local history books of the notorious twins (local criminals) the Fox twins, helping to build the police station! Now demolished, a doctors’ surgery now stands in its place. Amelia Briars ( 1852-1930 ) was one of 9 children born to Thomas Briars (1821-1857) and Amelia Biggs. She married Thomas Howard Kefford on the 2nd October 1873 in Stevenage. Thomas was a fish dealer who came from Hitchin, he died in 1884 at the age of 32. They had 2 children Herbert Howard Kefford (1874-1950) and Alice Kefford (1877-1953) neither of them married. As a young woman Amelia was an assistant teacher at the National School. 1891 Amelia was continuing with the fish dealership. 1901 she was a fish seller and shop keeper, with her son Herbert as assistant. 1911 she was listed as Confectioner, in Back Lane, and her son was still with her. The last 2 years of her life Amelia had failing health, but had for 39 years also been a stallholder on Hitchin Market. Travelling between Stevenage and Hitchin in a pony and trap. During the war years, she upheld the “ Stevenage Fair Charter ” by having a stall in the high street, selling sweets. Alice was in 1901, a servant to George Pallett, a farmer living in the High street between the Yorkshire Grey & Diamond pubs. She cannot be found in 1911 Census, and it is not known when she started to help out in the shop, but in 1930 when her mother died she carried on the business, until her death in 1953. In her will she left the property to her neighbour and friend Mrs.Florence Bates. Alice and Herbert’s grave is still standing in the Almonds Hill cemetery, although not in a very good condition. After Alice died, Millie Briars, daughter to Joseph,( Alice’s cousin ) took over the running of the shop, under the name, “ Millie’s Tuck Shop “. The shop was upgraded, and the walls were fitted with shelving and large glass jars of sweets lined the walls, as well as a larger selection of cigarettes, and a fridge with ice cream. At Christmas the main window was decorated with bubble lights and a giant Christmas cracker was hung in the window, and sold to the highest bidder. Millie was in the shop until about 1977. Thanks for the new information about Millie’s Tuck Shop, Peter. Many people seem to have fond memories of it. Margaret Ashby’s “Book of Stevenage” describes how the Stevenage Fair tradition was maintained during World War II thanks to Alice Kefford’s annual sweet stall in the High Street from 1940 till the end of the war. Stevenage Museum has a couple of other photos of the shop in Church Lane, which was known as Back Lane until the end of the 19th century. Your mum’s memory of the police station is correct, as it was in Stanmore Road between 1916 and 1959. Hello Pauline…My mother’s Aunt, Florence Bates (nee Filby) lived in ‘Regalwood,’ the property immediately adjoining Millie Kefford’s. (To the right just out of the picture). Would be fascinating to see any more photos or hear anecdotes! Mum seems to remember the police station being just behind Regalwood.